Regression equations were developed for estimating bankfull geometry—width, mean depth, cross-sectional area—and discharge for streams in Massachusetts. The equations provide water-resource and conservation managers with methods for estimating bankfull characteristics at specific stream sites in Massachusetts. This information can be used for the adminstration of the Commonwealth of Massachusetts Rivers Protection Act of 1996, which establishes a protected riverfront area extending from the mean annual high-water line corresponding to the elevation of bankfull discharge along each side of a perennial stream. Additionally, information on bankfull channel geometry and discharge are important to Federal, State, and local government agencies and private organizations involved in stream assessment and restoration projects. Regression equations are based on data from stream surveys at 33 sites (32 streamgages and 1 crest-stage gage operated by the U.S. Geological Survey) in and near Massachusetts. Drainage areas of the 33 sites ranged from 0.60 to 329 square miles (mi2). At 27 of the 33 sites, field data were collected and analyses were done to determine bankfull channel geometry and discharge as part of the present study. For 6 of the 33 sites, data on bankfull channel geometry and discharge were compiled from other studies done by the U.S. Geological Survey, Natural Resources Conservation Service of the U.S. Department of Agriculture, and the Vermont Department of Environmental Conservation. Similar techniques were used for field data collection and analysis for bankfull channel geometry and discharge at all 33 sites. Recurrence intervals of the bankfull discharge, which represent the frequency with which a stream fills its channel, averaged 1.53 years (median value 1.34 years) at the 33 sites. Simple regression equations were developed for bankfull width, mean depth, cross-sectional area, and discharge using drainage area, which is the most significant explanatory variable in estimating these bankfull characteristics. The use of drainage area as an explanatory variable is also the most commonly published method for estimating these bankfull characteristics. Regional curves (graphic plots) of bankfull channel geometry and discharge by drainage area are presented. The regional curves are based on the simple regression equations and can be used to estimate bankfull characteristics from drainage area. Multiple regression analysis, which includes basin characteristics in addition to drainage area, also was used to develop equations. Variability in bankfull width, mean depth, cross-sectional area, and discharge was more fully explained by the multiple regression equations that include mean-basin slope and drainage area than was explained by equations based on drainage area alone. The Massachusetts regional curves and equations developed in this study are similar, in terms of values of slopes and intercepts, to those developed for other parts of the northeastern United States. Limitations associated with site selection and development of the equations resulted in some constraints for the application of equations and regional curves presented in this report. The curves and equations are applicable to stream sites that have (1) less than about 25 percent of their drainage basin area occupied by urban land use (commercial, industrial, transportation, and high-density residential), (2) little to no streamflow regulation, especially from flood-control structures, (3) drainage basin areas greater than 0.60 mi2 and less than 329 mi2, and (4) a mean basin slope greater than 2.2 percent and less than 23.9 percent. The equations may not be applicable where streams flow through extensive wetlands. The equations also may not apply in areas of Cape Cod and the Islands and the area of southeastern Massachusetts close to Cape Cod with extensive areas of coarse-grained glacial deposits where none of the study sites are located. Regardless of the setting, the regression equations are not intended for use as the sole method of estimating bankfull characteristics; however, they may supplement field identification of the bankfull channel when used in conjunction with field verified bankfull indicators, flood-frequency analysis, or other supporting evidence. 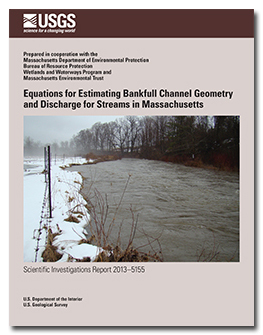 Bent, G.C., and Waite, A.M., 2013, Equations for estimating bankfull channel geometry and discharge for streams in Massachusetts: U.S. Geological Survey Scientific Investigations Report 2013–5155, 62 p., http://dx.doi.org/10.3133/sir20135155.